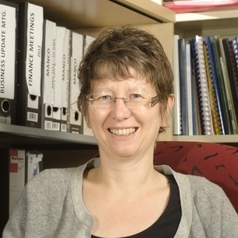 Dr Jane Goudge (PhD), the Director of the Centre for Health Policy, has been conducting research in the field of health systems and policy research for 13 years. She has a PhD in development economics from the School of Oriental and African Studies, London University. She is the South African research coordinator of a United Kingdom Department for International Development (DFID)-funded international collaborative knowledge programme on health systems and financing (2011-2016). She has worked on a range of issues: geographical inequities, national health accounts, public-private mix issues, pharmaceutical regulation, comprehensive primary health care, community health workers, and contracting with NGOs. Dr Goudge has 10 years experience in managing of international collaborative research projects involving proposal development, financial and project management, recruitment and supervision of research and administrative staff. She teaches the health care financing module within the School MPH, and currently supervises the research projects of 3 MPH students, and 4 PhDs. She was on the CHP management team since 2000-2005; and has been Director since 2009 to date. Although originally an economist, her methodological focus is been longitudinal qualitative methods. Her research has focused on the interaction between households and the health system, particularly the affordability of care and the extent to which the costs causes impoverishment, as well as the reasons as to why patients withdraw from ARV treatment, the role of community care givers in bridging the gap between households and the health system, and the potential of universal coverage in financing to increase access to care.